To recognize the extraordinary achievements and service of individuals who promote the objectives and purposes of the Adjutant General’s Corps and Adjutant General’s Corps Regimental Association (AGCRA) as set forth in the Constitution and Bylaws of the Association. Significant achievements and service contributions to the Adjutant General’s Corps and AGCRA must be met for approval. Any military or civilian personnel who is a member in good standing of the Association and who is a member of the Adjutant General’s Corps or other Human Resources professional, or affiliated with the Adjutant General’s Corps, when the award recommendation is submitted. Personnel may not receive this award more than twice. 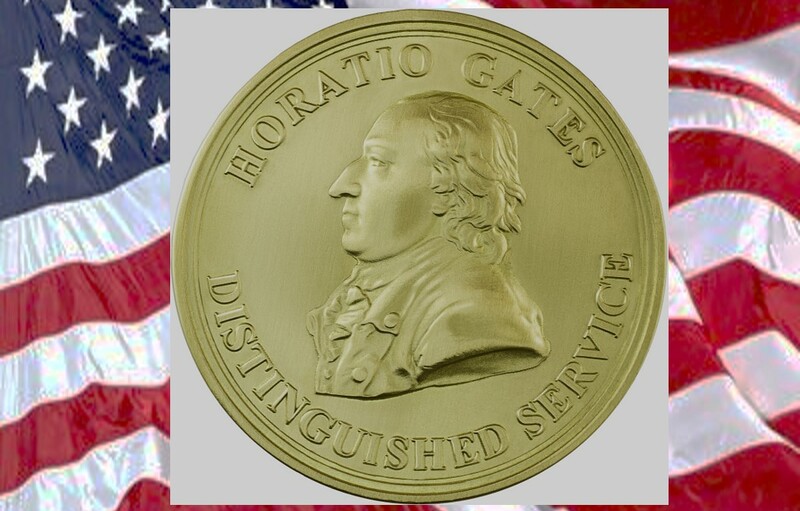 The Major General Horatio Gates Bronze Medal is awarded for distinguished achievements and distinguished service over an extended period of time to the Adjutant General’s Corps and Adjutant General’s Corps Regimental Association (AGCRA). Supporting the AGCRA is defined as supporting the local Chapter, which includes: holding or serving as a Chapter Officer or Committee Member and/or direct support to local Chapter activities, membership drives, fundraisers, Association meetings, lectures, Chapter breakfasts, local AG Ball, or any other activities sponsored by the Chapter leadership. Exceptions apply only to current members who are in a deployed location without a local Chapter. Note – AGCRA membership alone does not fulfill the significant service criteria for this award. The Major General Horatio Gates Bronze Medal is the second highest award authorized by the Adjutant General’s Corps Regimental Association. Horatio Gates was the first Adjutant General of the Army. A Gold Medal presented to Major General Horatio Gates by Congressional resolution to commemorate his victories over the British in the Battles of Bennington, Fort Stanwix and Saratoga. These three key battles prevented the British from occupying the strategic Hudson Valley and isolating New England from the other former colonies during the Revolutionary War. AGCRA created a Bronze Medal to recognize significant achievement and service to the Adjutant General’s Corps, Adjutant General’s Corps Regimental Association, and the Human Resources Community. A replica of the original Gold Medal, cast in bronze, honors Gates’ service and leadership. $35.00, borne by the recommending authority. Any person having firsthand knowledge of an individual’s achievement and/or service which meets the above criteria, can recommend that individual for this award. Recommendations, in memorandum format, will be forwarded by email (preferred method) to awards@agcra.com or mailed to the Adjutant General’s Corps Regimental Association, ATTN: VP for Awards, P.O. Box 10026, Fort Jackson, SC 29207-0026 as early as possible, but not later than 30 days prior to the requested presentation date. Memorandum must contain contributions to the Army and AGCRA, as well as desired presentation date. Recommendation must be endorsed by the local AGCRA Chapter President or senior Adjutant General Officer. If no Adjutant General Officer is available, a senior Human Resources professional will endorse the recommendation. Once the award has been voted by the National Executive Council and approved, payment may be made by check (payable to the AG Corps Regimental Association) or credit card. Credit card transaction can only be processed by the AGCRA VP for Awards. The National Executive Council will review award recommendations and base their vote on the merits of the achievement(s) and service. For approval of the recommendation, a simple majority of the members of the National Executive Council present and voting is required. Certificates for approved recommendations will be provided to the President of the Association for authenticating signature. When signed, the certificate and medal will be mailed to the recommending authority. If mailing has to be expedited, recommending authority will cover the costs. Presentation of medals and certificates will be made with an appropriate air of formality and at fitting ceremonies such as AG Balls, anniversary celebrations of the Adjutant General’s Corps, or AGCRA Chapter activations, activities, or retirement ceremonies.